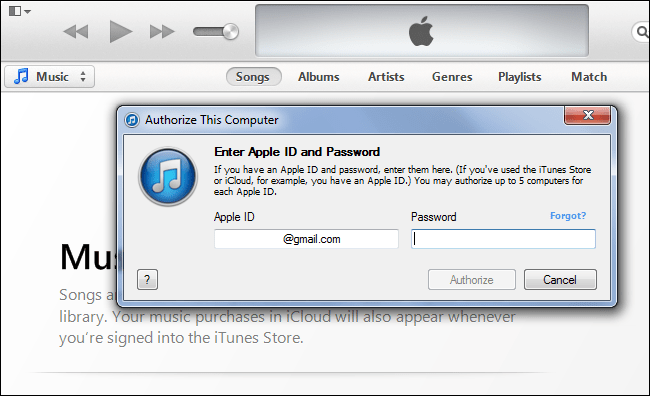 iTunes uses an authorization system to ensure only a handful of computers can access your purchased music, videos, and other content at any given time. 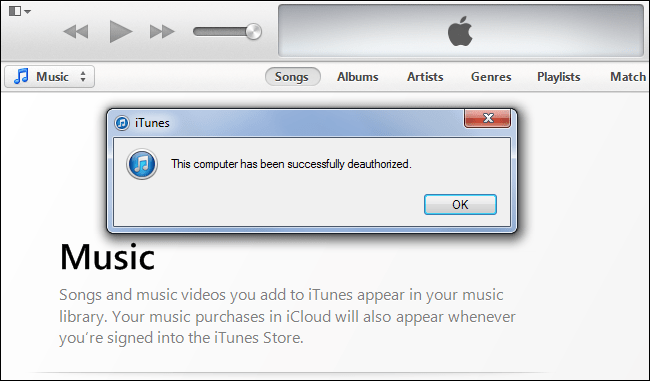 You should deauthorize iTunes before getting rid of a computer or reinstalling Windows. The authorization system is a form of DRM, so it involves jumping through hoops. It’s supposed to limit access to your purchased content. You must authorize a computer — Mac or Windows PC — in iTunes before that computer can download and use your purchased movies, TV shows, music, eBooks, audiobooks, apps, and other content. Note that this only applies to media with DRM. The majority of music files on iTunes are DRM-free, so you don’t have to authorize a computer to play them. You can have a maximum of five authorized computers tied to your Apple ID at the same time. Macs and Windows PCs both count towards this combined total. iOS devices don’t count towards the activation total, so you can have as many iPads, iPhones, iPod Touches, and Apple TV devices accessing your iTunes content as you want. This authorization system is a form of DRM, and it restricts access to the content you purchase on iTunes. Authorization systems were once fairly common — for example, witness the authorization limit in the old SecuROM system for PC games or the activation limit that can be built into Windows Media audio and video files. many services now restrict content to accounts and don’t necessarily limit the number of devices, but iTunes still uses the older scheme of allowing and disallowing individual computers. We wouldn’t be surprised if this was built into the contracts Apple signed with rights holders when they put their content on iTunes. Authorizing a computer is simple. 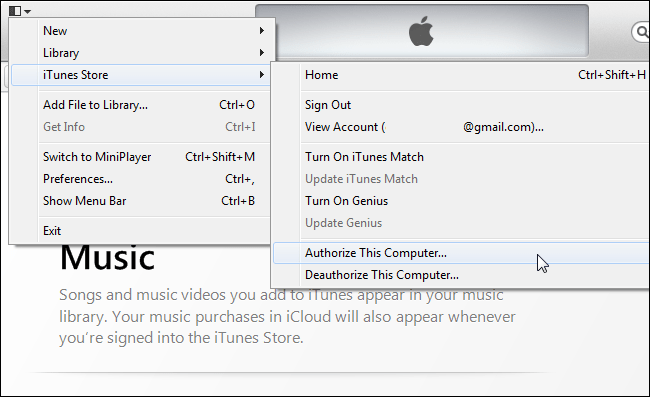 On Windows, click the menu button in iTunes, point to iTunes Store, and select Authorize This Computer. On Mac, click the Store menu and select Authorize This Computer. Sign in with your Apple ID to complete the process. Your computer will then be able to download, sync, and play your purchased iTunes content. You’ll also find a Deauthorize This Computer menu option in the same place. This menu option will revoke the authorization, preventing DRM-encumbered iTunes content from being watched, viewed, or downloaded on your computer. You should deauthorize your computer when you’re about to uninstall iTunes, if you’re about to reinstall Windows, or when you’re done with your computer and want to get rid of it. If you don’t plan on using your purchased iTunes content on a computer, deauthorize it. Apple also advises deauthorizing your computer before you upgrade its hardware components. If you don’t, your single computer may count as a different computer afterwards and use multiple authorizations. Deauthorizing a computer is important because it gives you one of your limited five authorizations back. If your computer breaks down and you can’t deauthorize iTunes, you get rid of a computer before deauthorizing iTunes, or you upgrade your computer’s components, you may have wasted authorizations. The old systems will probably count towards your maximum of five authorized computers. If you keep authorizing iTunes and getting rid of the authorized computers or reinstalling Windows, you may find yourself unable to access any of your purchased content because you can’t authorize any more computers. Apple only allows you to fix this in one way. You can’t just access a list of authorized computers and deauthorize individual computers. Instead, you’ll have to deauthorize all your computers at once. To do this, click iTunes Store in iTunes, sign in to your Apple ID, click the name of your Apple ID, and select Account. From here, you can click the Deauthorize All button next to Computer Authorizations. This button will only appear if you have more than one computer authorized. It will revoke the authorizations from all authorized computers, allowing you to start authorizing computers from scratch. Warning: You can only use the Deauthorize All button once per year. After using it, try to be more careful with your authorizations — deauthorize computers before getting rid of them, reinstalling Windows, or upgrading their hardware. If you find yourself unable to access your purchased content — or if you’ve used the Deauthorize All button once this year already and need to use it again — you can always try contacting Apple Support and asking them to reset your authorizations for you. This is all you can do, short of attempting to break the DRM.